Mewat: A atmosphere of tension prevails at the Shaheed Hasan Mewati Govt Medical College, Nuh, with doctors and staff of the college calling it a strike, following the assault of their colleagues at the hands of the local police. More than 25 doctors are reported to have been injured, with few in the ICU following the police lathicharge assault. The incident goes back to yesterday night, when a few policemen came to the emergency ward of the hospital in drunken state and began creating a ruckus. The doctors on duty called the SHO, who when came on the spot, further misbehaved with the doctors, rather than controlling the drunken men. More police force were then called, who lathicharged and beat the doctors and staff on duty. Superintendent of Police (SP) Kuldeep Singh, told Tribune another story. “The guard entered into a verbal spat with the police. He called his friends and members of the hospital staff, and held three policemen hostage. When the Nuh SHO went to resolve the matter, he was held hostage as well. Later, medical students joined the staff in harassing the police.”The PCR van was torched, forcing the police to resort to mild lathicharge to control the situation, the SP said. Students, on the other hand, claimed that the police set the PCR van on fire to save their skin. “We have videographic proof of it,” one of them said. The doctors of the hospital went on strike following the incident. 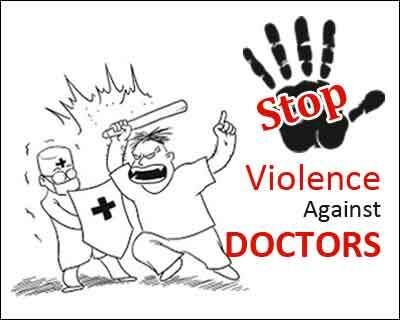 It is added that around 50 doctors have also tendered their resignation owing to the assault, reports Tribune. How can Health Deptt. suspend SHO? Don\’t know the true story,but I believe doctors version. It is typical of police in India to burn PCR/ or tear their own clothes or inflict minor injuries to twist the story. After all they are cousins of our politicians and have full licence for goonda gardi until the age of 60. I was personally a witness to similar incidence in 1992 in Delhi. If hospital authorities really take up the matter,police can be straightened. Unfortunately, it will not happen as most managements are spineless. Hand over the video clipping to MEDIA, court, other relevant agencies. Let the Law to take it\’s course. It is supreme Court orders to install CCTV cameras in sensitive areas. Doctors are being targeted everywhere. We need more stringent laws to handle such situations in future.